I really, really mentally drafted this piece back in January, after I became inspired to block my Seven Swans shoulder wrap made from Anne yarn following the January AKG meeting and the excellent blocking instructions from Heartstrings' Jackie Ericksson-Sweitzer. Her website is Heartstrings Fiber Arts and you can certainly see the gossamer-y, lightweight, oh-so-tempting pieces she creates out of her very own creative brain. Yummm. She writes all these lovely lacey shawl and sock and wristlet patterns that I carried with great joy and that fascinated many an adventurous knitter into seeing what could be done with all that gorgeous lace yarn. But then many things happened after that blocking experience, such as a visit from an old friend whom I had not seen since 1982 in London who was on this side of the pond from her home in small-town France; the annual AKG knitting retreat at The Mountain where I started both a cabled sweater for ME from Blackwater Abbey yarns (it's the Brambleberry Pullover made from the color Chestnut that you can see here at the BWA site: Blackwater Abbey Yarns) as well as the long-anticipated Orrenburg Lace Shawl that I bought at TKGA in April 2004 with dear G at my side. I figured that I was a good enough knitter by now to tackle that project, and I am, though just barely. More on those projects as they progress. Oh, and after the retreat came the temporary position with one of my temp services that lasted for about 10 days. It was great to be in the working world again, feeling like I was earning money from my own labors but someone else's pocket. Plus I had forgotten how much fun it is to listen to sales weasels make their deals! And then more work on my website, then a 6 week assignment that started at the end of March and went all the way through April. It was so very, very odd to be waking up and knowing that I would be working in someone else's space for the time being, doing the job that they assigned me to do in the way they wanted me to do it. I've been out of the real workday loop for a decade now, literally, and it was strange to leave the rhythm that my life has had for so long in order to enter another rhythm. That said, I have forgotten how much I enjoyed temp work - you work at a different location for a period of time, long enough to feel comfortable but not so long that you're caught up in office politics. And I have learned sooooo many different softwares and seen them in all of their applications, all thanks to temp work over the years. And then there was the Mythic Journeys movie on Saturday, May 2 at the historic Plaza Theater in downtown Atlanta that turned out to be a smashing success (you can view the trailer here at the Mythic Journeys website) but that also ate into evenings and weekends until the weekend of the showing itself. That said, it's been a busy spring for this little knitter, and I wouldn't trade very much of it for a refund! But down to blocking. The Saturday in January following Jackie's talk (I'm so enjoying saying "I did 'this' on Saturday! 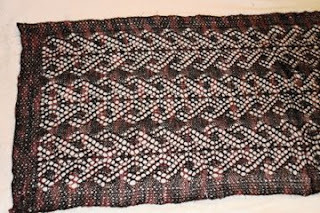 "), I decided that I would follow her instructions for blocking lace. Which entailed getting down on the clean floor with a good, big towel and some blocking pins. I wanted to make sure that the piece had all the rest of Saturday day, Saturday evening, and all of Sunday to dry properly. And it was later in the afternoon and I had spent some quality time stitching and listening to a book on tape, and I had had a late breakfast so why not block at 1:30 on a Saturday? I could always have lunch after I was done. Why give up all that drying time just for a little lunch, I ask you? 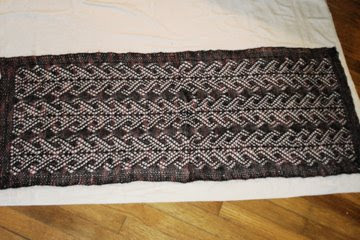 After all, how long could this blocking project take?? OK, well, it took about 2 1/2 hours. Never mind that it was a rectangle, never mind that my gauge was the same throughout, never mind that there was no shaping. Nope, it all had to do with the stretching of the piece as wide and as long as it needed to go without realizing that it had a mind of its own. This is the center of the piece. 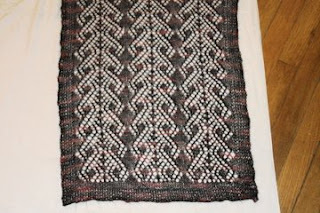 The name of the pattern is "Seven Swans" and it is from the book Traditional Knitted Lace Shawls by Martha Waterman and published by Interweave Press. 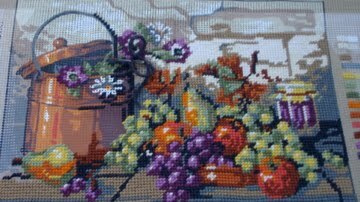 It is a piece that I started at The Mountain 2 years ago with help from a Master Knitter (and a couple of glasses of wine!). You start in the center of the piece with a provisional cast-on, so that as you wear the shawl over your shoulders, the swans' wings are all descending. And part of the blocking challenge was to get the center line straight and the swans' wings lined up both side-to-side and with one another. And while you may not be able to see it, I added an extra garter stitch row when I picked up the stitches from the provisional cast-on so that I would not be picking up AND knitting in the lace pattern. What a nightmare that could turn into! And here we have those pesky corners and that dratted edge that just won't stay straight. At least the swans' wings have finally decided to line up alongside one another! I think this was about 3:00 or so, and I was just so determined to get this piece done that I was going to ignore that rumbling noise in my tummy. Grrrr! Of course, with this piece as with all the myriad others I have blocked over the years, the corners just decide to have a mind of their own. The wings may stay straight up and down, but somehow, somewhere, is some extra give that the fabric finds and holds onto until you get onto the corners. It never fails. You have to pull the corners down as far as they will go without messing up the symmetry of the pattern, then pull the width between the corners again without messing up the symmetry of the pattern, then when you have pulled as much as you can from the edges, you then pull the corners UP so that the edges will give. Up. It's weird to type this technique out loud since it's one I discovered while blocking needlepoint and have never vocalized, but you have to account for the give in the corners by pulling the edges back up so that they are perpendicular to the lines of the design. 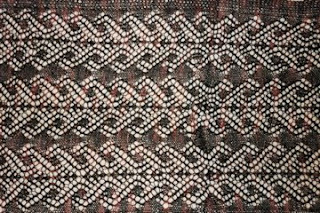 You can especially see the need for pulling the corner up on the left-hand side of this picture - see how the colorway of the fabric on the edge looks like it bends to the left? It does, and you have to ease that portion back up so that it is at a 90 degree angle. The pattern has pulled all of the give out of its range, but you won't know that until you've spent a good half hour trying to urge the pattern down to the range of the corner. When the pattern stops giving, it's time to pull the corners and the edges back up. But at least the center line is straight! I think by this time I had given up on the lack of sustenance and decided to eat. About 4:00 in the afternoon. The swans' wings were as opened as they could be, leaving edges that looked more like Crests of the Wave instead of edges. And of course, easing the edges back into alignment means that you run the risk of skewing the symmetry of the design elements. I thought perhaps that there was a rule that the portions of the lace pattern with more knitting on the edge would have the greatest give, but looking closely at this photo it seems that some portions pooch out more with knitting next to them, and others with an open lace stitch. There just seems to be no telling. The centerline at the top of the shot is still off, and I adjusted the edges to a greater or lesser extent, but this was the first time I had taken a look to see what the overall effect was. Truly a stunning piece. It's nice and light and, while you can't see it from these photos, the yarn has a deep plum tone that stands out from the darker purple-black shades. It is light but warm, and I wore it with my friend Jane when we saw "Benjamin Button" in early February. A good weight for a movie sweater. So I'll say here again, blocking is a process. A very long, involved, down-on-your-knees process, especially with the fine-ness of lace process. And so (wearing my wisdom dispensing hat as I have for lo these many years), it is best to eat first, then block.